The West Coast of the United States is a different geological environment than the Atlantic and Gulf coasts and experiences different types of forcing (waves and surge from extratropical storms rather than hurricanes). A major goal of this work is to begin developing a framework for a West Coast coastal hazards assessment, similar to the assessments for the United States’ Gulf and Atlantic coasts. Many of the differences between West and East Coast beaches are rooted in the different geologic settings. East Coast beaches lie on a passive margin so they are depositional with low relief topography. They are typically composed of unconsolidated sandy beaches backed by wind-formed dunes and fronted by a broad, low-sloping continental shelf. In contrast, the West Coast is backed by high relief topography and fronted by a narrow continental shelf. These coastlines are primarily composed of sea cliffs and extensive dune fields. The length of the West Coast is also punctuated by occasional resistant headlands that break the shoreline into a set of weakly connected littoral cells. The predominant forcing also varies between coasts, with typical tides and waves being roughly twice as high on the West Coast. Extreme significant wave heights often surpass 10 m (Ruggiero and others, 2010). The dominant storms on the East Coast are hurricanes and major Nor’ Easters with associated large waves and storm surges up to several meters. 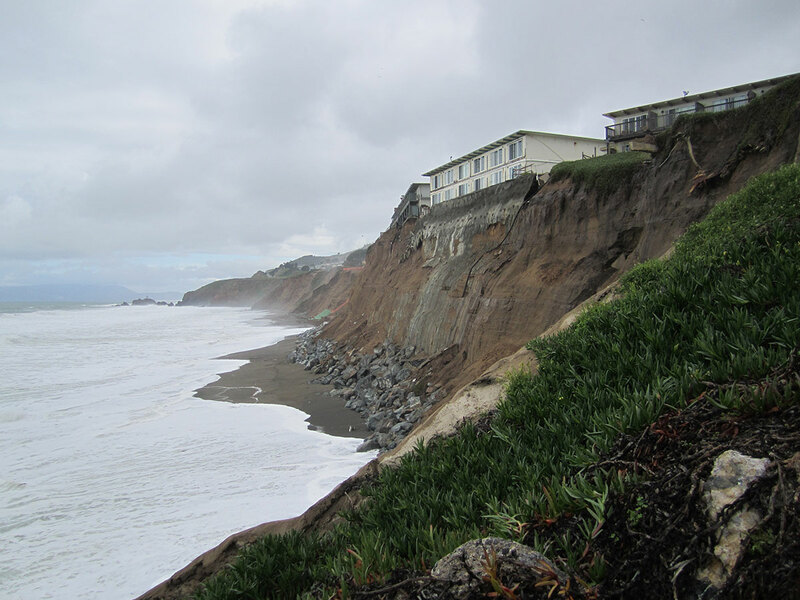 The relatively narrow West Coast continental shelf combined with shorter durations of storm events results in relatively minor storm surges with less catastrophic instances of coastal flooding, but erosion and slumping of sea cliffs pose a hazard. These differences introduce a new set of challenges to the National Assessment of Coastal Change Hazards program. While the aim of the research will be for National consistency, some of the methods that work well on East and Gulf Coasts may have to be modified for application to West Coast beaches.